When the architectural standard of metal roofing is made with the metal that defines longevity, the result is our MRN standing seam panel in solid zinc. Offering all of the consistently of vertical panels along with one of the most corrosion-resistant metals available, these roofs are guaranteed to create a distinctive feature for any building. 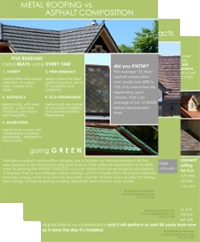 Our solid zinc roofing is also available in a striking diamond shingle profile.